The Test Cell Kit allows experienced users to easily build many high performance Dye Solar Cells with a high degree of reproducibility. Whether your want to expand your Dye Solar Cell expertise, or completely jump-start your research, the Test Cell Kit removes the barriers and fires up your productivity. For research and development, comparative studies, or high level courses, the Test Cell Kit is specifically tailored for the most demanding activities. 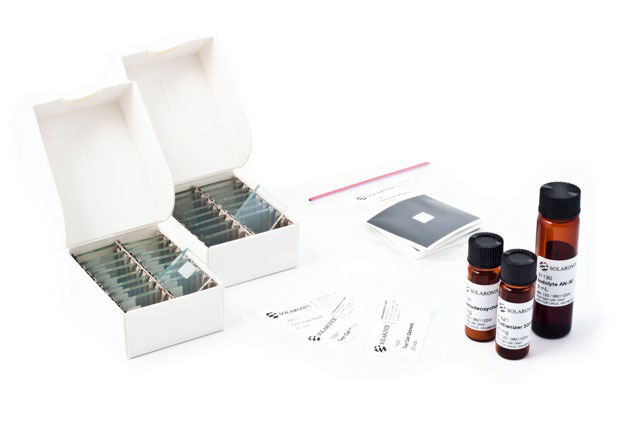 The Test Cell Kit is the perfect match of ease of assembly and reproducibility. With an active area of 6 x 6 mm, your Test Cells won't suffer from the side effects observed with larger surfaces, and will allow you to precisely understand changes. Titania Electrodes, opaque, 16 pcs. Platinum Electrodes, drilled 16 pcs. 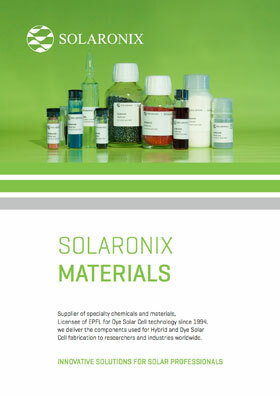 Same as the first bundle, but all chemicals including dye, staining additive, and electrolyte are conveniently supplied together for best performance. Titania Electrodes, transparent, 16 pcs. Platinum Electrodes, drilled, 16 pcs. Bare Electrodes, drilled, 16 pcs.